Craigielaw Golf Course & Lodge sits on a stunning outcrop, watching over the mouth of the River Forth and the North Sea beyond, creating the setting for a golf break to remember. Although, the golf course is one of the youngest on Scotland’s ‘Golf Coast’, it has already hosted the Scottish Senior Open in 2018 and is ranked in the top 80 courses in the country. The Lodge at Craigielaw is the perfect addition to Donald Steel’s magnificent golf course, located just 30 minutes from Edinburgh, it makes for the ideal base from which to play East Lothian’s epic courses. The Lodge features well-appointed rooms and is attached directly to the clubhouse. 1 in 16 goes free between 1st April 2019 and 30th September 2019! Located in the picturesque village of Aberlady, and bordering the traditional links at Kilspindie, Craigielaw is not a classic seaside course. Massive, undulating putting surfaces give the course an American resort edge, but the overriding influence is the firm, sandy turf underfoot. Being a modern build, Craigielaw is longer and more open than many older links, but the key to scoring still lies with the short game. The tough greens and the endless cavernous bunkers which surround them make this course a real gem. 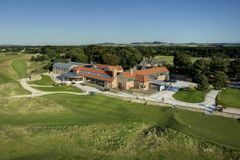 Despite its youth, Craigielaw has already been awarded the 2006 Scottish Amateur Strokeplay Championship, and the qualifying for the 2007 Senior Open Championship, to be staged at nearby Muirfield. The excellent practice facilities at Craigielaw make it a haven for some of Scotland's best golfers. The Lodge at Craigielaw is attached to the clubhouse of the Craigielaw Golf Club and boasts 25 comfortable rooms which can either be arranged as doubles or twins depending on preference. 13 of these rooms benefit from views which overlook the course to the River Forth, Gullane Golf Courses and the kingdom of Fife whilst the remaining 12 enjoy the peaceful and secluded view across an attractive courtyard. The restaurant and bar area have eye-catching views of the Cragielaw Golf Club, as well as this there are some of the UK’s finest restaurants located in the city of Edinburgh, including numerous Michelin star establishments, there are also local gems in the towns of Longniddry and Prestonopans, which would need to be researched on the internet beforehand. With over 40 miles of superb coastline, sandy beaches, stunning cliffs, rolling countryside and many award-winning tourist attractions to explore whilst staying at the Lodge at Craigielaw there will be no shortage of activities to keep you occupied, and that’s without even mentioning the 22 golf courses in East Lothian alone. North Berwick, Gullane and The Open Championship course at Muirfield are just some you may be familiar with. For a one night stay with golf it had everything you required for your comfort, the two course dinner and breakfast was excellent and the room was quiet and comfortable. the course was in good condition, the greens slightly slower as per time of year, a strong wind made it quite difficult, even although it was busy I was round in 3.30 hrs. Only bad point was tee times a bit random.